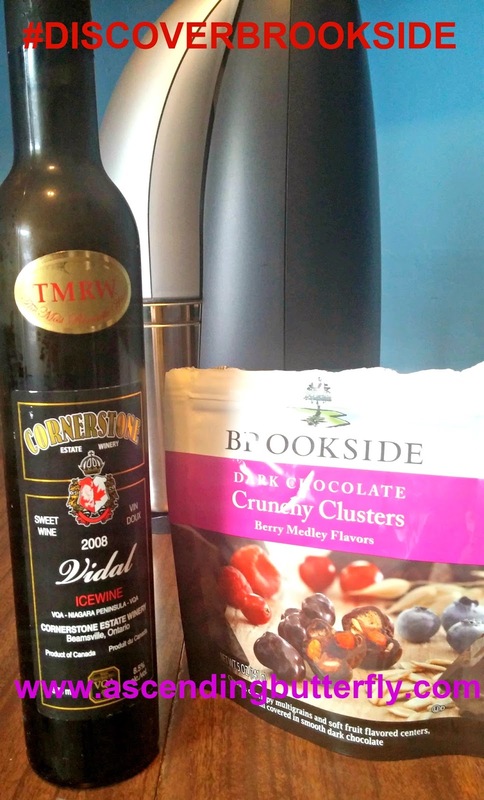 I chose to pair IceWine Exclusives TMRW Vidal IceWine with my Brookside Dark Chocolate Crunchy Clusters and it was the perfect combo! Don't get me wrong, wine and cheese is still aces in my book, but I have been attending tastings that are dedicated to pairing wines with chocolate and I have enjoyed them and wanted to re-create the experience at home. TMRW - The most Romantic Wine are carefully selected handcrafted Icewines from Canada which I have featured on Ascending Butterfly before (see our coverage of the NY Wine Festivals for more info or their website), are such an exception to my palate rule. I tend to lean toward dry and less sweet wines, but TMRW wines offer such 'balanced complexity' that they are 'sweet and refreshing' in my book, not cloying or annoyingly sweet, but just that perfect sweetness that doesn't overshadow. BROOKSIDE Chocolates combine exotic fruit juices and clusters of crispy multi-grains with soft fruit flavored centers with sweetened cranberry bits covered in smooth dark chocolate. I love that they offer a 'crispy, fruity' taste with a dark chocolate. Together they made the perfect combo. The chocolates are not super sweet, so pairing them with a sweet wine gives all your senses a little rush! What pairing will you try today on #TryMeTuesday Butterflies? Have you ever paired Wine with Chocolate? FTC Disclosure: This is a sponsored post and all opinions are 100% my own! I am disclosing this in accordance with the Federal Trade Commission 16 CFR, Part 255 - Guides Concerning the use of endorsements and testimonials in advertising, you may check our Giveaway and Disclosure Page for additional information regarding Ascending Butterfly Disclosure. @Masshole Mommy - Thanks! Now that I am understanding wine a bit more, it's fun trying pairings that slightly alter the flavor and experience a bit! I've never had wine and chocolate before. My girlfriend loves it, though. I like brookside chocolates. They're rather tasty. I've never thought to pair them with wine though. @Mary - I actually attended a tasting where the wine brand offered a variety of chocolates with suggested pairings, we were asked to sip the wine first and taste it without anything else, then take a bite of the chocolate and try a sip of the wine, and it did change the flavor profile. It was fun and they did both red and white wines which I didn't expect, so as soon as the Brookside arrived I knew I wanted to try a wine, and the icewine with it was a super nice way to go. Sounds delicious! I do love brookside products and have had their chocolate covered acai berries and they were awesome. Will have to try these clusters. @Audrey - I actually like the clusters the best of the three, something about the chocolate with the bit of crunchy that really appeals to me. The wine sounds good for wine drinkers. I would love to try the Dark Chocolate Crunch Clusters. It sounds like you have the same taste for wine that I do. I don't usually go for the sweets either. I need to grab some Brookside and do some pairings! @Liz - I will always be a champagne girl first and foremost, but when it's not bubbly for me, it's usually dry, so I am delighted to find something sweeter that my palate really enjoys! But Chocolate and wine pairings are fun, and I did a tasting that paired chocolate with Tequila and I want to explore that one a bit more at home too! Chocolate is my weakness. I keep eating dessert until I hit chocolate, so I've learned that I better just start with the chocolate. The Brookside clusters sound great. I love a good IceWine. I'll need to pick some up soon. Pairing wine with chocolate is something I enjoy late at night. I've never tried chocolate with wine. I love enjoying berries and wine. Love the Brookside brand. I love me some wine and chocolate! This sounds like it would go with a great date night! Yummy, this sounds like a great pairing. I' have tried brookside chocolates ( I love their chocolate covered pomagranite.) I'll have to try TMRW Vidal IceWine. As always thanks for bringing new for us products to try !! I would love the brookside chocolates just because of the cranberry. I love cranberries! @mail4rosey - Same here, love the use of cranberry in a great snack treat too, it's entirely un-expected but tastes so good! Brookside is my go to chocolate brand. I love their pomegranate ones! Yes! I love wine and chocolate! Dark chocolate and red wine is awesome! I had some wine with chocolate tonight. It was the perfect little treat. Well doesn't this sound like the PERFECT night?? I love chocolate and wine! January 1, 2015 - A New Years Prayer!